So last night I secured my status as major geek. 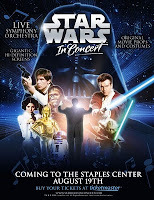 With much excitement, I went to see Star Wars In Concert. I contemplated going in costume but I did not have a lot of time to prepare so, sadly, I did not. I did however enjoy the show almost as much as this guy enjoyed his rainbow. Fine, I'll admit it. I cried. Just tiny little tears though. Not double rainbow sobs, but little teeny tiny geeky tears. Anthony Daniels, who played C3PO, gave a brief narration between each piece of music played. In the background, a huge screen played images of the movie set to the music. Each set was crafted as a piece of the Star Wars story showing a montage of clips on a particular theme, ie: Anakin, the Princess, Yoda, the Droids. There was an accompanying laser light show to round it out. The show, for a Star Wars fan, is amazing. Incredible. Fantastic. If you are not a fan, and dragged there solely to please your geek wife, then it is good. But we really don't want your opinion, you non-obsessed person. If you want a review that is not only well written but captures everything I felt during the show, you can read this one. Heck, his review made me tear up. Little geeky tears of happiness. In a way that only Star Wars can make me. Now if you will excuse me, I am going to watch all the movies. In a row. With my lightsaber and my R2D2. And remember this, Han shot FIRST. I'm jealous. The show was here in May and I wanted to go and my husband was all "you go...have fun with that"...and I was all "whatever. You have no appreciation for the 'finer' movies in the world"...And I stomped of. Okay, I didn't stomp off, but don't worry yourself with such minor details :). Star Wars is the best! That must have been great to see the show. I do love Star Wars. And I know I'm geek...adding in Harry Potter and the Twilight trilogy. But I must say...I'm not sure I would have sat thru this musical. I like musicals...but I don't know. I've never even heard of such a thing! But now that I think about it, would I sit through Harry Potter in concert (if there was such a thing) and my guess is yes. So yeah, I'd probably see this too! 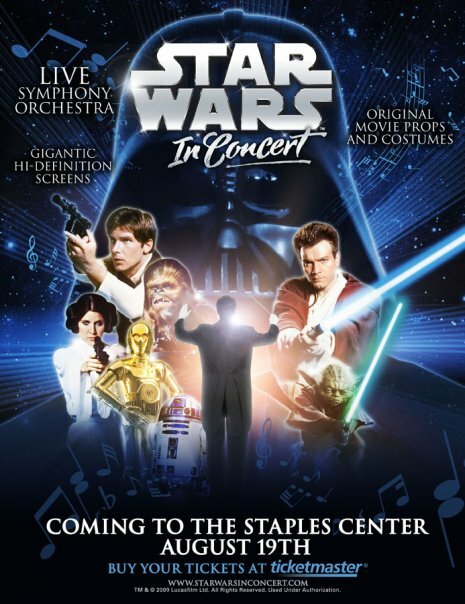 I love movie music! What a great experience - I would have cried too. I've still never seen any of them!! You are officially my favorite certified geek! Pic of you with Princess Leia hair buns? Puhleeze?? LOL..I have never been a SW Fan BUT know plenty of people who love those movies. In concert must have been great!